Q-Eye is a third-party QlikView data file editor built by DB Software Laboratory. It’s an interesting product that allows a QlikView designer or developer to view or edit the QVD and QVX files that are produced during the QlikView development and build process. 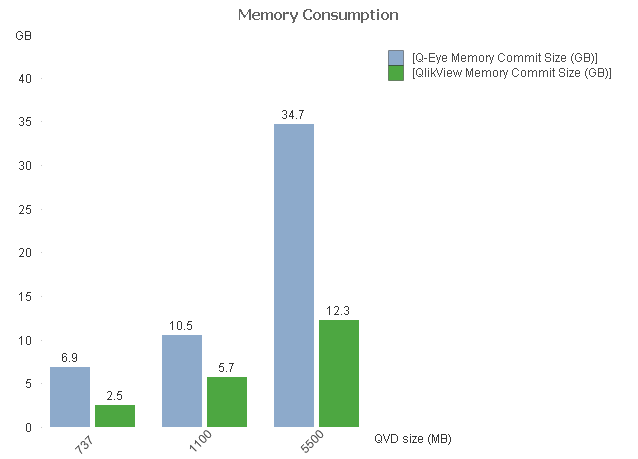 DB made a bleg for someone to test the 64-bit version and produce some memory consumption statistics. I downloaded the software and tested it and also reviewed it for my own use. Inspect the contents of QVD files that I am about to use. During the execution of a load script, I store the contents of intermediate memory tables into QVDs and can then inspect them using Q-Eye. This is very helpful for troubleshooting and debugging. You should download it while it is still free! 1) Q-Eye is slow at opening very large files (see the Performance Statistics below). It needs to become faster. 2) Need to be able to drag and drop QVD files from Windows Explorer into the Q-Eye window. 3) Windows Explorer’s right-click Open With shortcut needs to have Q-Eye registered as a target for QVD files. 4) When you first open a QVD with Q-Eye, it loads only the first thousand rows. This is not intuitively done, particularly for a new user, who eventually figures out that he must click on the Load All button. It would nice to make this more obvious somehow, perhaps with a popup that appears over the Load All button once the initial load is complete. 5) The user needs the ability to tell Q-Eye that certain columns are dates or timestamps. Otherwise, they display the raw number. Even better would be to examine the content and if it is a floating point number in the date range, display it as a date. 6) The search feature should have the option to search for Null values in a field, as well as any non-Null value. 7) Like most Windows apps, double-clicking on the border of a column should auto-size it. 8) When loading very large files, the progress bar shows the % complete as white letters on a light green background which is hard to see. 2) The auto format Grid feature greatly oversizes text fields. It looks like it is not actually sampling the content. Environment: MacBook Pro booted into Windows 7. This laptop is a high performance system with 4 cores and 16 GB of RAM with an internal flash drive. 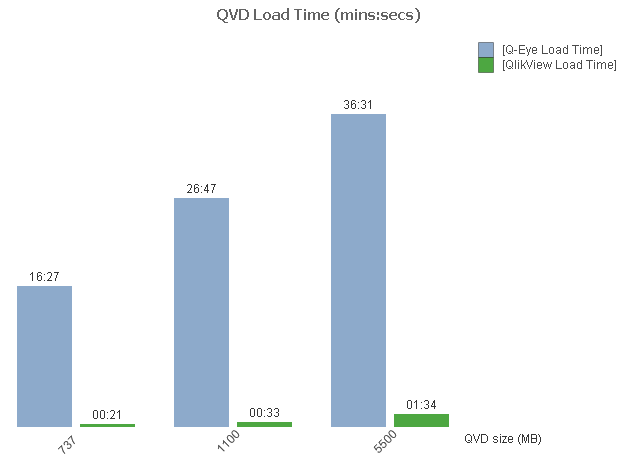 Since a picture is worth a thousand words, here are charts of the QVD Load time and Memory Consumption for Q-Eye and QlikView vs. the QVD file size. As you can see, the load speed and memory consumption of Q-Eye got progressively worse as the file size increased. However, Q-Eye still loaded even the largest file fully and was able to display its contents. Conclusion: Q-Eye is definitely useful for inspecting small QVD files and is still usable for opening very large QVD files. If you’re interested in visualization, check out this very cool TED talk by Hans Rosling, accompanied by interesting visualizations. The information visualization technique used by Trendalyzer is an interactive bubble chart. By default it shows five variables: Two numeric variables on the X and Y axes, bubble size and colour, and a time variable that may be manipulated with a slider. The software uses brushing and linking techniques for displaying the numeric value of a highlighted country. Trendalyzer appears to not be available for general purpose use. It seems to be bundled along with world health, mortality and other developmental index data. It would be interesting to see its time dimension features incorporated into other BI visualization products like QlikView or Tableau. I started a Blogspot blog several years ago and contributed a few posts to it off and on over the years. Then I revamped this web site using WordPress and wondered if I could import those few posts into this blog. After enough Googling and experimentation, I can recommend the plugin SEO Blogger to WordPress using 301 Redirection. It did a very clean job and I was able to pull over my blog posts, categories and even the comments. A library to parse user-entered form data such as telephone numbers, social security numbers, dates, etc. and intelligently convert them to usable and normalized forms, with country codes, area codes, etc. I am planning on using CMake and Subversion. My C#.NET application needs to read from an Oracle database. There are many elaborate ways to connect to a database in .NET, including the Linq for Entities ORM. However, this was way too much for my purpose. I’ve found the following code to be much simpler. It’s largely copied from a C# Station post. The key difference is that you have to use the OracleClient class.